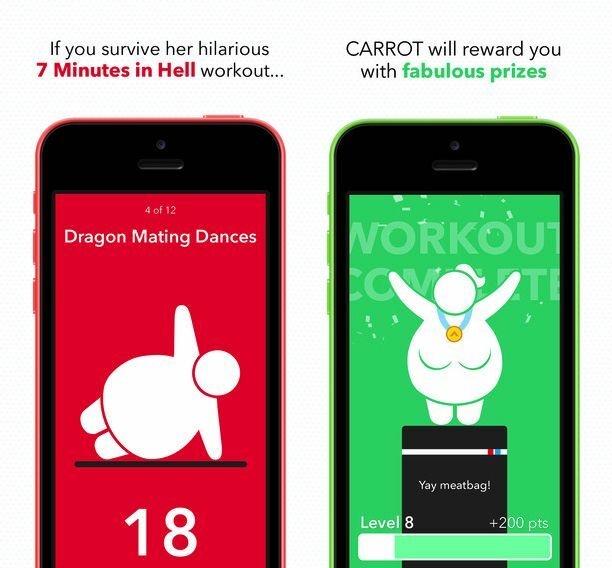 For those who don’t know, CARROT Fit is an hilarious take on the fitness app: a little bit like 2001: A Space Odyssey‘s H.A.L. meets Full Metal Jacket‘s memorable drill sergeant Gunnery Sergeant Hartman. Welcoming you with a message of “Greetings, tubby human,” CARROT Fit is a snappily sadistic AI that will threaten, inspire, ridicule and bribe you into getting in shape over the course of a 7-minute workout. It’s a surprising amount of fun, and today’s update adds news punishment in the form of ads and “random squirrel attacks.” There’s also iPhone 6 optimization, iPad support, and Dropbox data sync thanks to Apple’s new privacy requirements. The app additionally promises the usual improvements and bug fixes. Earlier this week it was reported that Apple was pulling various health-related apps due to a fault with HealthKit. While Apple’s promised to resolve the problem by the end of the month, currently it doesn’t look like CARROT Fit integrates with the new iOS 8 Health app. Until Apple fixes the problem, however, this is a great way to go about launching into your new iOS fitness regime. CARROT Fit is available for download from the iOS App Store for $2.99 at this link. Otherwise, you can download CARROT’s Tough Love Pack, which bundles CARROT Fit along with the equally amusing CARROT To-do and CARROT Alarm apps , for just $5.99.